Get the the BEST soap ever in a 3-pack at a discount. This high qulaity bulk Kombucha soap smells fantastic, comes in a bunch of "flavors," contains active Kombucha culture (tea and SCOBY), and rinses very and soft - never dried out! Maximum number of stars - and more if allowed! Everything I have ever ordered from Kombucha Kamp - from scobies to teas to spigots to tea balls to hand thrown brewing vessels to soaps - has been of excellent quality, with exceptional service. The genuine concern for each brewer's success, the patience and thoughtfulness, are unsurpassed and have been consistent through the years. I started brewing quite a long time ago through a lively and helpful Yahoo group, and as informative, encouraging and cozy as that was, I doubt I would be brewing now if not for Hannah Crum. Many, many thanks. I have never been disappointed with any product and service from Kombucha Kamp so I decided to go all out and purchase the 3-pack Kombucha soap made with organic teas and cultures. My sensitive skin and dry hair have never felt so soft and nourished! Getting ready to place my second bulk order. Purchased the sampler of 3 SCOBY soaps. I can't tell you how much I LOVE this product! Leaves your skin super soft, non-irritating ( I have sensitive skin), great scents. Very Natural!!!! The way soap should be. Will definitely be reordering and giving as a gift. LOVE LOVE LOVE!!! everyone I gifted this soap to was very pleased, I have introduced them to a fantastic product! I just want to tell you that the product is unbelievable. Love it. Love it. Love it and already told a couple people, they're placing orders if not already as we speak so love your product love your site. Thank you. 5 stars - love this soap!!! I got the mint soap and it is wonderful. Makes my skin feel smooth. The soap is so gentle and leaves your skin feeling so soft! The soaps smell sooo good and the three bar pack offers you an opportunity to try several different scents. We are allergic to artificial fragrances that are so often used in products, but we can use these wonderful soaps without worry because they contain essential oils and natural ingredients, not chemical fragrance. They make your entire bathroom smell wonderful and I like to keep our extra supply there. I think my favorite is Soap Pure......even though unscented, it has a lovely clean smell. I use All Spruced Up to bathe my little male cocker. He smells so good.... a nice masculine smell for a little boy dog and it kills any fleas hiding in his coat. That is a plus! Our vet asked what I had used to bathe him in .....she commented that his coat was so soft. All natural....and healthy! Thank you for carrying this wonderful soap!!! Think of these soaps when you are looking for a special gift! 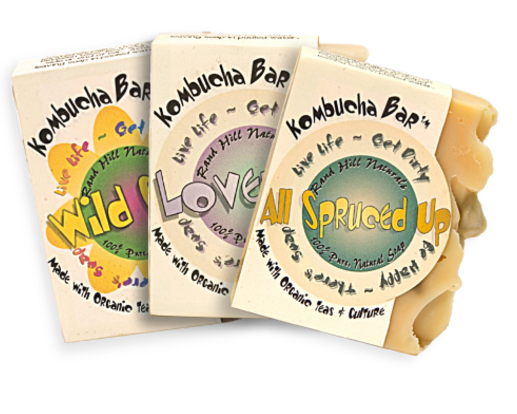 Five Stars for Kombucha Soap! I usually like unscented products, but tried "wild child". In the drawer, it scented the entire bathroom---so fresh! As I carefully unfolded the wrapping of my KT soap bars pleasant fragrances permeated the room. I gently smelled each bar identifying the scents while admiring the colorful paintings. I set a bar on it's side in my powder room. While cleansing I was gratified as I was taking in good bacteria and essential vitamins. Using such a fine soap produced a squeeky clean me. I highly recommend these natural soaps. Thank you Randie, Hannah, and Alex for the BEST soap ever! Fabulous bar soaps! I have dry sensitive skin and this soap leaves my skin smooth and hydrated!I have spent YEARS trying to find a body soap that is perfect. The quest is finally over! The honey buzz bar is wonderfully fragrant, as is the patchouli!! I also purchased a fragrance free bar, which is my absolute favorite. Thank you so much K' Kamp! Will be reordering for life! Super fast shipping too! This is my favorite soap to use in the shower. My skin is never dry after using this. I've loved all the different fragrances that I've tried but Wild Child is my favorite. The scent is very nice, not overpowering or perfume like. I've also given this as gifts to several friends and they have all loved them. I am very happy and satisfied with my purchase!!! My brother and I loveeee the kombucha bar soaps. The soap is very cleansing and I feel so good afterwards because I know I am getting probiotics on my skin as well! Not just important on the inside but the outside for the skin as well! Probioitcs are everything to me!!! I love probiotics it helps me with depression and mood and my serenity!!! The Kombucha soap is amazing! Great lather, feels great on the skin, rinses clean. This soap makes my skin happy. I will definitely purchase more of this product in the future. A friend gifted me one of the Whirl-O-Mint soaps ... and while I was skeptical because I have such sensitive, very particular skin, after one or two uses, I was hooked! Now it's my only bath soap, I order in bulk. Leaves my skin clean and soft, the Mint and Pure versions have no allergens that affect me at all :) YAY! Something special is magically different about this soap, and I'm so happy to have found it! My friend introduced me to this wonderful smelling soap. Love the way it rinses so clean. I'm a fan! Wow! This is the best soap! We have been buying handmade soap from our local Farmer's market for years. When I saw this kobucha soap I didn't hesitate to purchase the three pack. I am so glad I did! It arrived super fast and when I opened the package I could smell the soap. Smells sooo good! I got honey buzz, Czech mate and p&l. They all smell great and its a good sized bar. Giving them for Christmas gifts. Will be ordering more! I recently purchased some kombucha soaps form you after accidentally stumbling on to your web page. I can honestly say this is the best soap I have ever used in my life. I have shared them with my daughter and my brother and his wife and my BFF. All of us are thrilled. My skin just keeps getting softer and softer. My brother's athletes foot problem started clearing in just two days after being plagued with it for years. I am such a HUGH kombucha fan. If I can keep myself covered with kombucha inside and out, I'm a "happy kamper". No pun intended. Everyone should try these soaps.you would be amazed. They seem to fix "what ails you". And once again Hannah, thanks for the phone call. That personal touch was appreciated. As a new kombucha drinker and brewer (two months), I tell everyone who will listen about it. Wahoo, I feel better than I have felt in years. All of the Kombucha Kamp products have a thumbs up, five star rating in my book. Really folks, just try it once, you'll be hooked. Wanted to let you know your soaps are GREAT! They're especially GENTLE -- yet still VERY EFFECTIVE for my needs. You make a TERRIFIC SOAP LINE -- KEEP UP THE EXCELLENT WORK. Thank-you very much for making these fine soaps available for purchase. WORTH EVERY PENNY! Quick response to a minor problem....amazing soap! The perfect gift! I have been so pleased with all of my Kombucha Kamp purchases that I didn't hesitate in ordering the 3 pack of soap and they didn't disappoint! This soap is the best! Natural and nourishing! Getting ready to place another order. This soap is awesome! I love the way it cleans and rinses completely without having a film or dryness. I use it on my face all the time and I no longer have extremely dry skin in some areas and oily skin in others. Will definitely be buying more! I was having problems with a TJs brand of soap irritating my skin. I needed relief fast. I decided to try this Kombucha soap, since I love Kombucha. I am so happy I did. The minute I started using it, I felt relief. It's hard to explain, but this soap makes you feel so good. This will be my soap of choice from now on. Thank you so much for the kombucha soap. I got 6 different scents and gave them all as presents, they smell fantastic. My dad was very impressed as he is a kombucha fanatic. The delivery to Australia was surprisingly quick and I'm so happy they arrived well before Christmas. Next time I need presents for quirky kombucha friends I will buy from you again. I love, love, love this soap. I am ordering my second order now. It feels so good and rinses well. I have very dry skin and have tried all kinds of soap that promised to moisturise....my legs leave dandruff on my jeans even! I decided to try the unscented and OMG!!! I don't have to put lotion on anywhere now! I LOVE...LOVE....LOVE this bar!!! I will have to order more cause I have almost used up my first bar! These Kombucha soaps are AWESOME! I ordered the Honey Buzz, Lovender & Wild Child bars. I'm still using the Honey Buzz bar right now and the scent is AMAZING and my skin is so soft and feels wonderful after using this soap! Can't wait to try the Lovender and Wild Child next. They smell GORGEOUS! Highly recommend this product! Yay! Thanks to Hannah for another wonderful product! Being a "hippie at heart" I got the 3 pack and chose all fragrances with patchouli in them. I am using 'Wild Child' first. It is so creamy, smells wonderful, and is really lasting. Also, it seems to leave no residue on my skin AND my skin is more moisturized after my shower than with other products! Does not "strip" my skin. I don't need moisturizers like before! Awwwwwwesome! This IS the BEST soap ever! I love the scents and the way my skin feels after using it. WoW this soap is wonderful!!! Lush silky smooth feel and lasts great!! Great on sensitive skin too. Top shipping fast even to Australia.